FOR PROFESSIONAL USE ONLY- Pure Brazilian Original Reconstructor Solution is Step 2 in the 90-Minute 3-Step Hair Smoothing Process. Original Reconstructor is the secret potion that transforms your frizzy hair into silky, soft, kink-free locks that dry more quickly than you ever thought possible! The Original Solution contains Ingredients such as Keratin, Cocoa, Amino Acids, Acai and Vitamins to make your hair look and feel wonderful. Every 1 liter bottle yields up to 30 treatments. Results last up to 3-4 months with no downtime. The result is stronger hair shafts, smoother cuticles, less frizz, and a luxurious radiant shine! Ingredients: Water (Aqua/Eau), Glycerin, Dimethicone, Hydrolyzed Keratin, Euterpe Oleracea Pulp Oil and Euterpe Oleracea Pulp Extract and Theobroma Grandiflorum Seed Butter and Hedychhium Coronarium Root Extract, Acai Extract, Cetearyl Alcohol and Behentrimonium Methosulfate, Paraffinum Liquidum, Hydroxyethylcellulose, Benzalkonium Chloride, Vinylpyrrolidone, Methylene Glycol, Disodium EDTA, BHT, Fragrance (Parfum), Methylchloroisothiazolinone, Methylisothiazolinone. Transforms Your Frizzy Hair Into Silky, Soft, Kink-free Locks That Dry More Quickly Than You Ever Thought Possible! Leaves The Hair In An Overall Healthier Condition- You Can Wash Your Hair The Same Day! 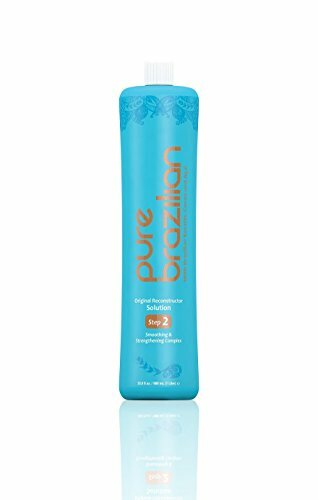 If you have any questions about this product by Pure Brazilian, contact us by completing and submitting the form below. If you are looking for a specif part number, please include it with your message.